Drip or trickle irrigation is the latest development in irrigation system design. Small amounts of water are allowed to trickle slowly into the soil through mechanical devices called emitters, wetting the soil without runoff. The emission rate of water ranges from about 2 to 9 liter per hr (0.5 to 2 gal/hr). Emitters are connected to a small plastic lateral tube, laid either on the soil surface or buried just beneath it for protection. Some drip irrigation systems have the emitters built into the lateral line or tube. The lateral lines are connected to a buried main line that receives water from a head source. The head source is the control station for the system. Here the water is filtered, may be treated with fertilizers, and is regulated for pressure and timing of application. less water is needed to grow a crop. the distribution of roots may be restricted to the small volume of wetted soil. 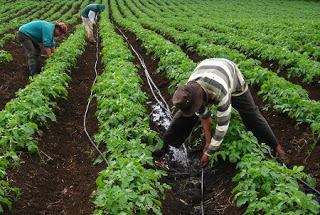 Drip irrigation may not fit the needs of every crop or situation, but its use by orchardists, strawberry growers, or namental nurseries, and for some high-yield field crops is rapidly increasing. 0 Response to "Drip irrigation System Design"